With its eerily quiet corridors and lack of activity, the Central Bank of Myanmar building in Rangoon serves as testament to the haphazard policies of the Burmese government’s past. Occupying a large compound in the north of the city, this vast structure has remained under-used since civil servants in Rangoon started to pack up government offices and leave for the then half-completed new capital of Naypyidaw in the early hours of November 6, 2005, a moment reportedly chosen by astrologers. Burma’s post-independence monetary history is a classic case of fact being stranger than fiction, a period in which former dictator Ne Win demonetized the local currency twice without advance warning – in 1985 and 1987 – with predictably disastrous results for ordinary Burmese: many lost their savings. That was in additional to the demonetization of the currency in 1964. But as the nominally military government which took power in March 2011 proceeds with an ambitious reform agenda, central bank Deputy Governor Maung Maung Win says the next stage of a plan to unify multiple exchange rates- including the withdrawal of Foreign Exchange Certificates (FEC) from next year- will be an altogether more predictable process. “If the foreign-exchange trading business and foreign exchange transactions among the banks are smooth and still stable … we can withdraw the FEC from the market,” he said. Those that hold FECs, an exchange currency whose face value is (officially) equal to the U.S. dollar, would be given time to swap them for the greenback or Burma’s currency, the kyat, said Maung Maung Win. A period of at least six months would be set, he said, during which people would be able to exchange FEC bills with the central bank and continue to use the currency. Then it would go out of circulation but the general public would still be able to exchange FEC with the central bank, possibly for up to five years, he added. “If a customer wants to change [for] Myanmar kyats, we can pay Myanmar kyats at the daily reference rate,” he said, referring to the managed-float system introduced in April. This was the first major step in a lengthy process of Burmese currency reforms planned over the next few years in consultation with the International Monetary Fund. If everything goes according to plan, it would not only represent the first time since independence that Burma has managed to withdraw significant numbers of bank notes from the money supply without causing chaos, it would also herald the end of one of the most unusual currencies in the region. 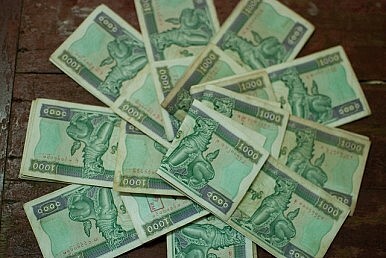 Introduced in 1993, FECs were designed to offer a bridge between foreign exchange and the kyat in a country which officially banned its citizens from holding foreign currency and – as a pamphlet introducing the currency noted – “for the enhancement of foreign exchange earnings” as the country faced Western sanctions and the prospect of dwindling foreign reserves. It was a masterstroke by a government running out of ways to generate much-needed foreign exchange. At first, tourists were required to change U.S. $200 into FECs and foreign companies doing business in Burma – so too aid agencies – were forced to deal with this parallel currency, and at a rate significantly below that of the dollar versus the kyat.